Vacation Mode @Yahoo? How About Evening Mode, Original Content Mode, and Walkie Talkies With Texting? Called it. I recently asked “When did you last eat without using digital devices at all?” and proposed a “dumb camera mode” where you could only take/review photos/videos and perhaps also write/edit text notes on your otherwise “smart” phone that usually made you dumber through notification distractions. Five days later @Yahoo published a news article titled: “The One Feature Every Smartphone Needs: Vacation Mode” — something I’m quite familiar with, having recently completed a one week Alaska cruise during which I was nearly completely off the grid. Despite the proposals in the Yahoo article, I still think a “dumb” capture/view mode would still be better on a vacation, where all you could do with your device was capture photos/text/GPS and subsequently view/edit what you captured. Even limited notifications distract and detract from a vacation. However, the idea of “social media updates only from people you’re close to, either geographically or emotionally” would be useful when not on vacation. I'd use that as an Evening Mode most nights. In addition, the ability to filter and only see “original content — no shared news stories on Facebook, no retweets on Twitter” would be great as reading prioritization — I only have a minute, show me only original content, or show me original content from the past 24h before any (re)shares/bookmarks etc. This strong preference to prioritize viewing original content is I think what has moved me to read my Instagram feed, and in contrast nearly ignore my Twitter feed / home page, as well as actively avoid Facebook’s News Feed. Ideally I’d use an IndieWeb reader, but they too have yet to find a way to distinguish original content posts in contrast to bookmarks or brief quotes / commentary / shares of “news” articles. The Yahoo article suggests: “tame your inbox in the same fashion, showing messages from your important contacts as they arrive but hiding everything else” and completely misses the point of disconnecting from all inbox stress while on vacation. While I was on the Alaska cruise, other members of my family did txt/SMS each other a bit, but due to the unreliability of the shipboard cell tower, it was more frustrating to them than not. With my iPod, I completely opted out of all such electronic text comms, and thus never stressed about checking my device to coordinate. Instead I coordinated as I remember doing as a kid (and even teenager) — we made plans when we were together, about the next time and place we would meetup, and our general plans for the day. Then we’d adjust our plans by having *in-person* conversations whenever we next saw each other. Or if we needed to find each other, we would wander around the ship, to our staterooms, the pool decks, the buffet, the gym, knowing that it was a small enough world that we’d likely run into each other, which we did several times. During the entire trip there was only one time that I lost touch with everyone and actually got frustrated. But even that just took a bit longer of a ship search. Of course even for that situation there are solutions. My nephews and niece used walkie-talkies that their father brought on board, and that actually worked in many ways better than anyone’s fancy smart phones. Except walkie-talkies can be a bit intrusive. If walkie-talkies can send high quality audio back and forth in broadcast mode, why can’t they broadcast short text messages to everyone else on that same “channel” as well? 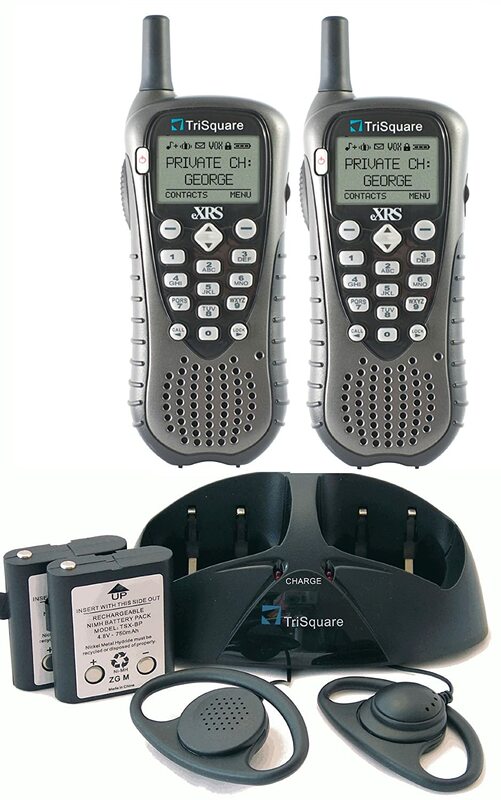 Anybody have one or a similar two-way radio that also supports texting? Or would it be possible to do peer-to-peer audio/texting purely in software on smart “phones” peer-to-peer over bluetooth or wifi without having to go through a central router/tower? That would seem ideal for a weekend road trip, say to Tahoe, or to the desert, or perhaps even for camping, again, maybe in the desert, like when you choose to escape from the rest of civilization for a week or more.